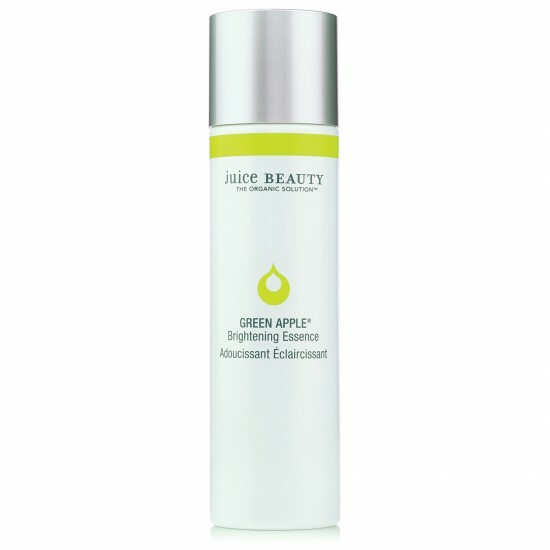 Juice Beauty Green Apple Brightening Essence is a pumped up toner that has several anti-aging and brightening ingredients. It visibly soothes, refines and balances the moisture on the skin with the hydrating part of the essences and the brightening portion gives a more luminous complexion because of Zanthoxylum fruit, tamanind seed and the infamous green apple cocktail of age defying malic acid, alpha lipoic acid, CoQ10 and DMAE help to improve skin texture and clarity. The Juice Beauty Green Apple Brightening Essence is designed for all skin types, 20's and up and is effective for helping dark spots, discoloration, and uneven skin tone and texture. NOTE: this is the only GREEN APPLE® product that is designed for sensitive skin. This Brightening Essence helps to soothe skin and it reduces the appearance of redness with alkylamides isolated and extracted from the Zanthoxylum fruit. It does leave a thin veil of moisture on the skin from polysaccharides of the tamarind seed. It reduces the appearance of pores, hyperpigmentation, and it prepares skin to absorb serums and moisturizers more effectively. Products formulated without parabens, petroleum, propylene or butylene glycol, sodium lauryl sulfates, pesticides, phthalates, artificial dyes or synthetic fragrances. Their products are never tested on animals. This product contains malic acid, which is made from apples, and is rich in vitamins, potent malic alpha-hydroxy acids, phytonutrients, flavonoids, phenols; and provides powerful antioxidant activity to help promote beautiful skin. It also has Aloe Juice, rich in glycoproteins and soothing properties, it can help improve hydration and skin's natural moisture content. It has organic orange, which is rich in vitamins, lycopene, phytonutrients, flavonoids and citric alpha-hydroxy acids; provides powerful antioxidant activity that can be beneficial in helping promote beautiful skin. This toner provides the following benefits: it provides powerful antioxidant activity that can be beneficial in helping promote beautiful skin. Cucumber hydrates and can help tone, soothe and soften skin. Green Tea is a potent antioxidant that can help promote beautiful skin.There is Licorice Root, which is derived from the plant root with clarifying and brightening properties. Finally, it has sunflower oil that is a rich source of Vitamin-E with emollient, softening and moisturizing properties. My thoughts on this product are that it really comes through in a pinch if you just want to do a light swipe in the morning, or right after a cleansing to make sure you got everything. It does brighten up the skin. Products with these ingredients do well at getting rid of age spots, freckles, hyperpigmentation, sun spots, whatever you want to call them. Skin has more of an even tone and looks pore porcelain doll as a goal. Juice Beauty is sold on www.juicebeauty.com, www.ulta.com and www.sephora.com. It is sold at other places online. Like Juice Beauty on Facebook:https://www.facebook.com/JuiceBeauty; Follow Juice Beauty on Twitter:@juicebeauty; Follow Juice Beauty on Pinterest:https://www.pinterest.com/juicebeauty/; Follow Juice Beauty on Instagram:https://www.instagram.com/juicebeauty/ and Subscribe to Juice Beauty on Youtube:https://www.youtube.com/juicebeauty.